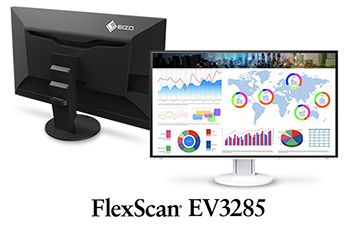 Hakusan, Japan, June 5, 2018 – EIZO Corporation (TSE: 6737) today announced the release of the FlexScan EV3285, the new flagship model in the FlexScan series, and successor to the EV3237. The monitor features a 31.5-inch 4K LCD display with a new frameless design and USB Type-C connectivity, making it ideal for control rooms and offices. The FlexScan EV3285 is a large 31.5-inch monitor with a 4K Ultra-High-Definition (UHD) resolution (3840 x 2160 pixels), providing a large working space in which to run multiple applications. Furthermore it has 140 DPI, so that it can display images and text with excellent sharpness and clarity. It is the successor to the FlexScan EV3237, and offers many new and improved features. The monitor has a new frameless design that makes it perfect for multi-monitor environments and distraction-free viewing. The cabinet is available in either black or white with matching cables to ensure that the monitor fits the aesthetic of any office. It comes with a unique space saving and ergonomic stand with 195 mm height adjustment and 344 degrees swivel. An attachable cable cover and cable holder also come with the monitor, for storing cables neatly behind the monitor. An optional stand bracket (PCSK-03) is also available for attaching a thin client or mini PC to the back of the monitor without affecting stability or movement. The monitor comes with two HDMI, one DisplayPort and one USB Type-C input to ensure connectivity with any PC. Furthermore multiple inputs can be viewed simultaneously on the screen with the Picture-by-Picture (PbyP) and Picture-in-Picture (PinP) functions. With PbyP, the screen can be split into either 2 or 4 sections; each displaying a separate input signal or application. With PinP, an additional input signal can be viewed in a corner of the screen, above the main image. With the USB Type-C input, a single USB Type-C cable can transmit video, audio, and USB signals and supports a super speed transfer rate of up to 5 Gbps. In addition, the FlexScan EV3285 can supply up to 60 watts of power for recharging notebook PCs and other devices via one USB Type-C cable, eliminating the need for separate power cables. The clarity of images, thin frame and vast connectivity make the monitor perfect for control rooms, conventional office and CAD use, as well as dealing rooms. The FlexScan EV3285 is also compatible with EIZO’s proprietary software Screen InStyle, which lets users assign a preset mode to applications and adjust the circadian dimming and power settings of one monitor or all monitors in a multi-monitor setup. An additional feature allows switching of the monitor inputs using user-defined hot keys rather than the switches on the front of the monitor. A server app for Screen InStyle gives an administrator control over the settings of all FlexScan EV3285 units in an installation from a central location. This is especially helpful for enterprises that want to ensure all units are adjusted properly and the power-save settings are activated. 2018 marks 10 years since the first EV – EcoView – series FlexScan monitors were released. Learn more about the EV-Series and see what technological advancements have happened over the past 10 years: www.eizoglobal.com/products/flexscan/10-years-ev/index.html. The FlexScan EV3285 will begin shipping in August 2018. Date of availability varies by country so contact the EIZO group company or distributor in your country for details. EIZO, which means image in Japanese, is a visual technology company that develops and manufactures high-end display solutions. EIZO integrates hardware and software technologies with consulting, web hosting, and other services to help customers in business, graphics, gaming, medicine, maritime, air traffic control, and other fields work more comfortably, efficiently, and creatively. Headquartered in Hakusan, Japan, EIZO has R&D and manufacturing facilities in Japan, China, Germany, and the US, and representation in more than 80 countries. * DICOM (Digital Imaging and Communications in Medicine) is an international network standard established by the American College of Radiation (ACR) and the National Electric Manufacturers Association (NEMA) for consistency between medical image data and manufacturer medical imaging devices. The standardized display function for grayscale images is specified in Part 14 of the contents. **Ambient illuminance must be more than 500 lux (typical office environment) and viewing distance more than 35 cm.